I was on the Road to the Isles path from Corrour railway station on Rannock Moor to Glen Nevis and onward to Fort William, and I had made it as far as Lùibeilt Bothy. I was startled to run into a couple of deer stalkers at Lùibeilt. They had come in on a small four-wheel drive machine over the rough track from the south. 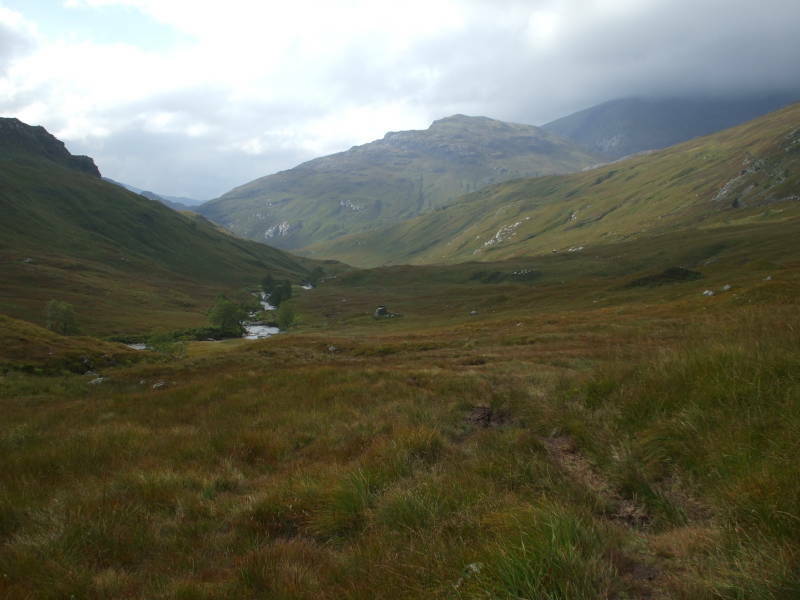 There is a track leading south from Lùibeilt, then southwest along Loch Eilde Beag and Loch Eilde Mòr and eventually to Kinlochmore. That track could serve as a sort of emergency escape route from The Road To The Isles, but it's at least 12 kilometers from Lùibeilt to Kinlochmore with nothing but one probably unoccupied lodge along the way. 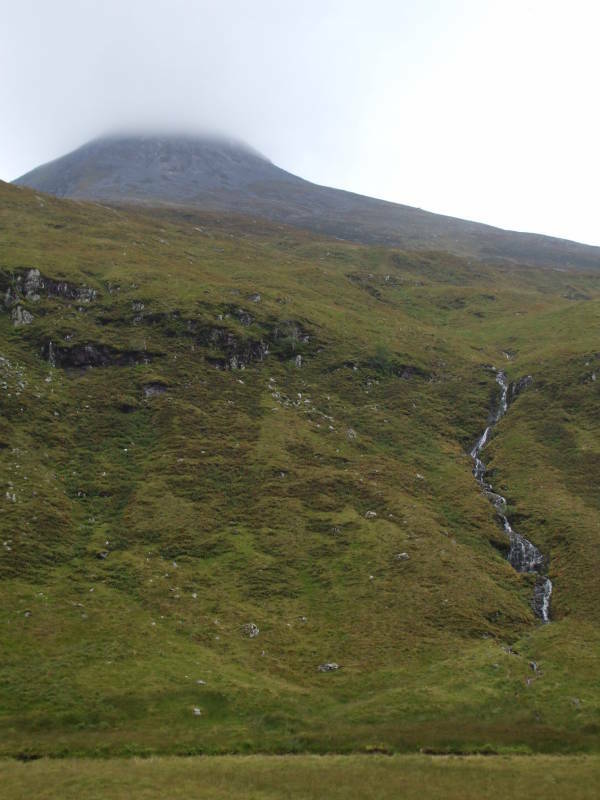 The path continued west to the watershed area, between Meall a' Bhùirrich and Sgurr Chòinnich Mór to the north and Sgurr Eilde Mór to the south. 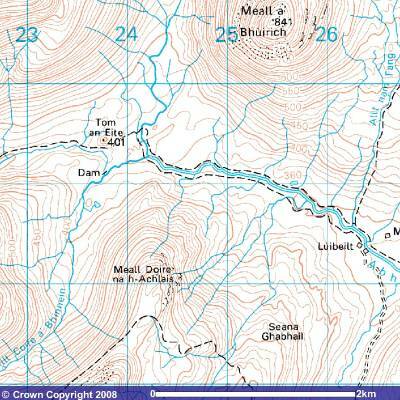 Tom an Eite is marked on this map, in the past there has been a rough metal shed here. Really, there was a shed in the area, a shelter for Highland deer stalkers. Very roughly, the watershed is around NN 240 690. The origins of Abhainn Rath. The navigation is straightforward. You're in a large valley running roughly straight east-west between two mountain ranges. Just keep going the same direction. The hard part would be figuring out just which stream you're paralleling and which direction it's moving. The watershed itself is a bit vague. Nothing dramatic. But you do see the valley opening up in the distance as it goes down to the west from here toward Glen Nevis. 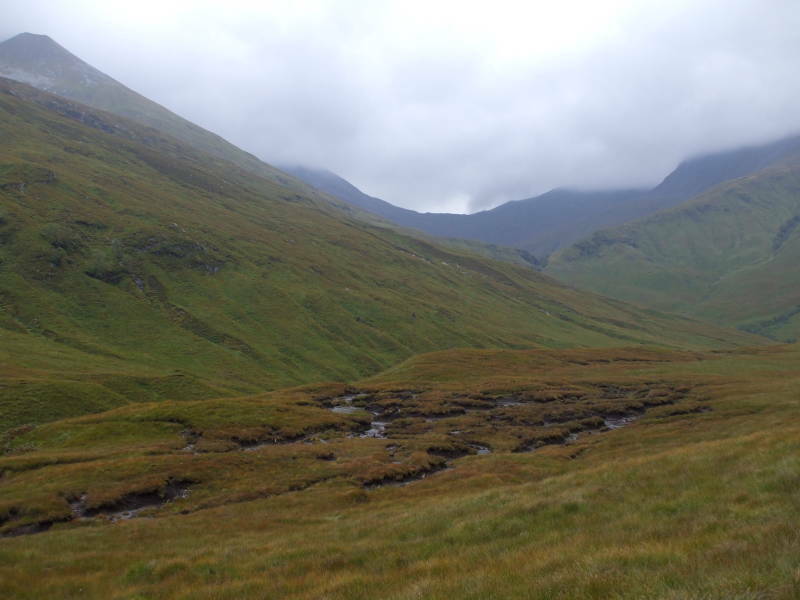 Continuing to the watershed at Tom an Eite from Lùibeilt. Starting down from the origin of the Water of Nevis toward Glen Nevis. What is that strange glow on the side of the mountain? By 1400 I was definitely over the watershed. The myriad little streams were trickling more or less in the direction I was traveling, not against it. I even — very briefly — saw some sunlight on the slopes of the mountains on the north valley wall ahead. 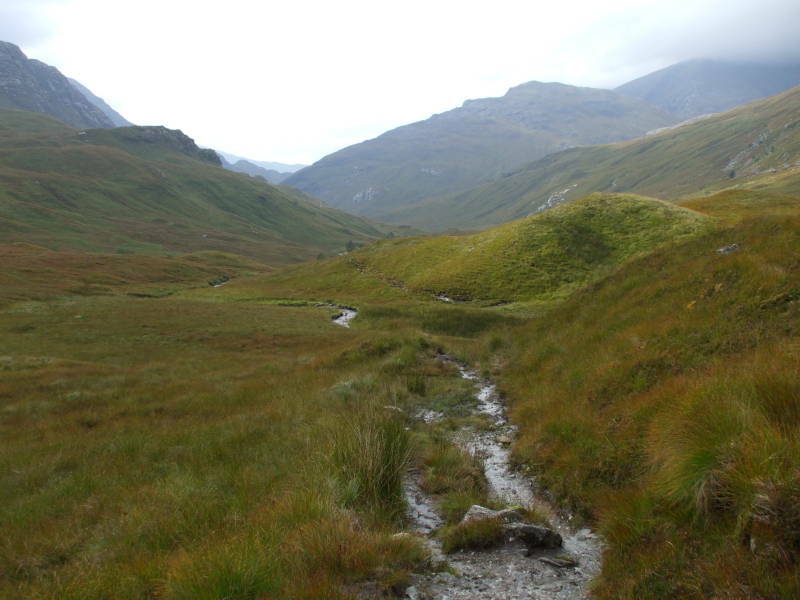 The many tiny meandering streams join together until a main one is headed west down the valley toward Glen Nevis. 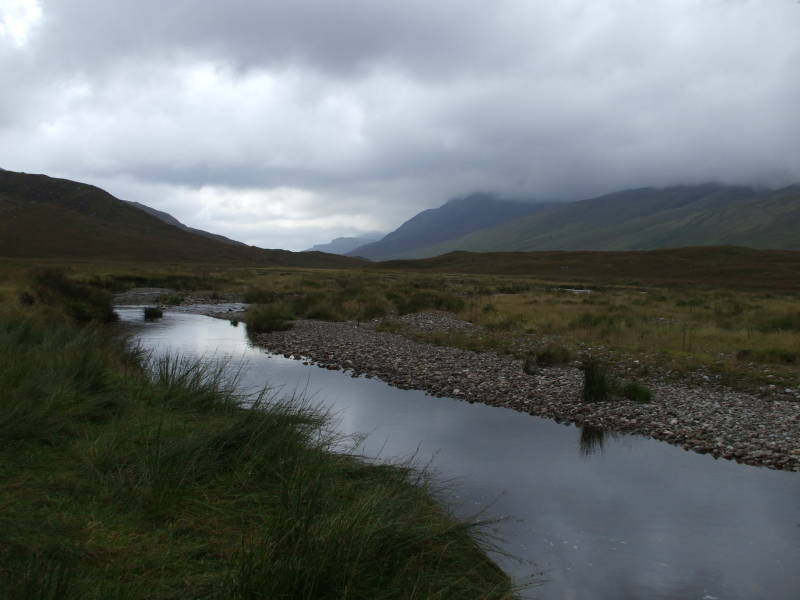 It's small up here, but this is the Water of Nevis, a small stream here that becomes the fairly large River Nevis that exits Glen Nevis at Fort William. You can easily step across the Water of Nevis near its origin. Many small burns come down the mountain sides to join the Water of Nevis. 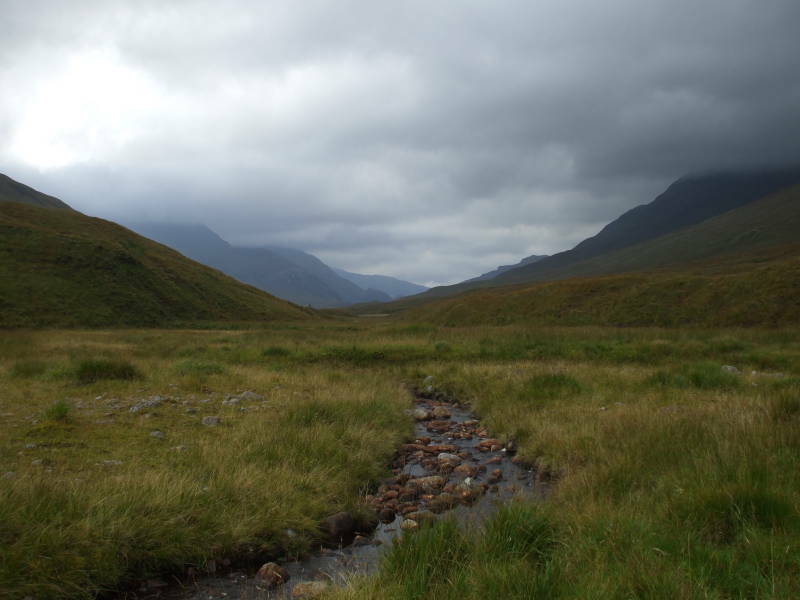 An untold number of burns or small streams flow down from the mountain ranges on each side to join the growing Water of Nevis. As the Water of Nevis becomes larger, the path parallels it at greater distances to the north, rolling over the bases of the range of mountains forming the north wall of the valley. The path is well to the north of the Water of Nevis and covers some rolling terrain at the bases of the mountains to the north. The Water of Nevis grows, and has eroded a deeper stream bed. You return and see the Water of Nevis from time to time, and notice that it's rapidly growing as it takes in all the small tributary burns from each side. 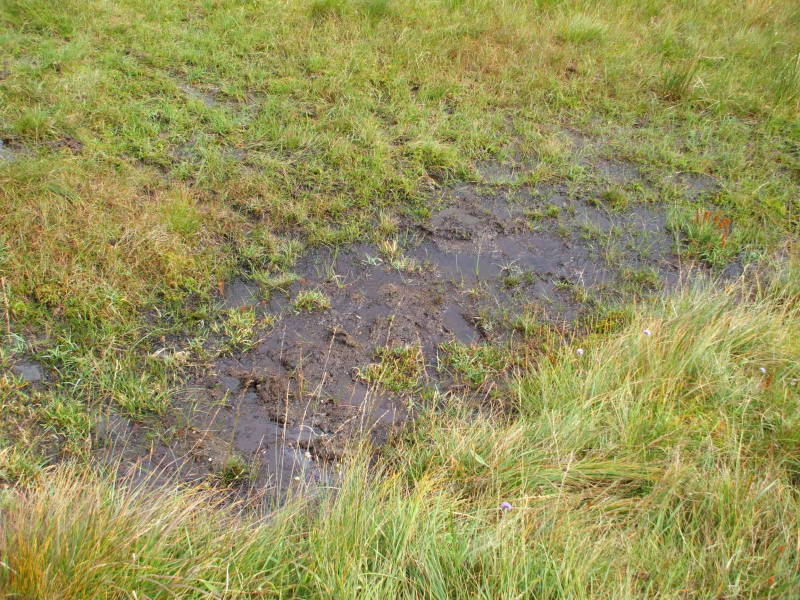 The path may be significantly higher than the Water of Nevis, but that doesn't mean that it isn't still very boggy. The soil is saturated with water, even in relatively "dry" areas you still see water squeezed out around your feet with every step. Don't think that we're out of the boggy parts. There's more of a definite path near Glen Nevis. 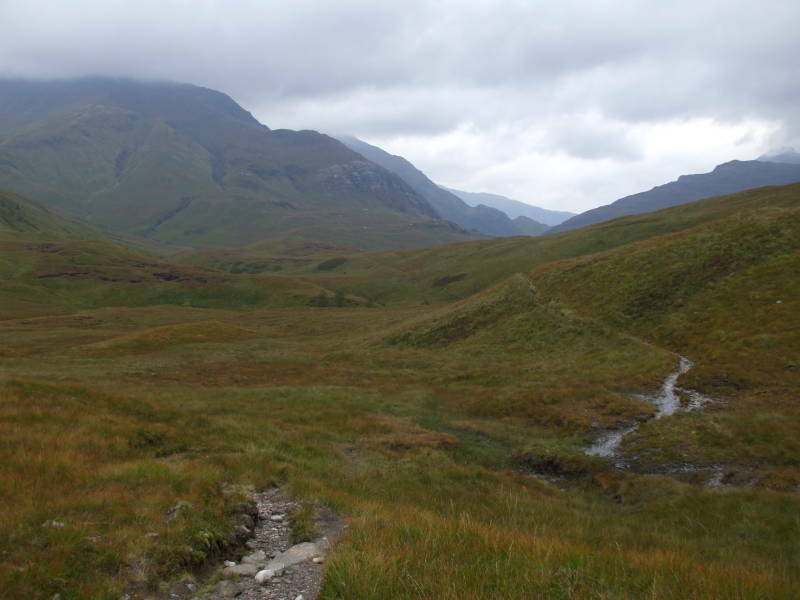 The path becomes more distinct, and more chewed up and muddy, the further you go toward Glen Nevis. 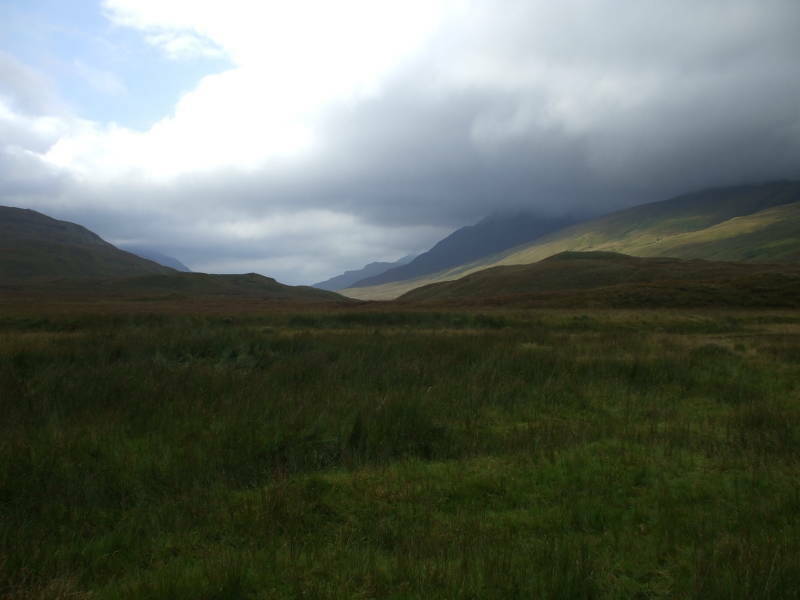 A number of people drive to the Glen Nevis roadhead and walk in for a few kilometers, and then return. As for the forms of bogginess, some is obvious. 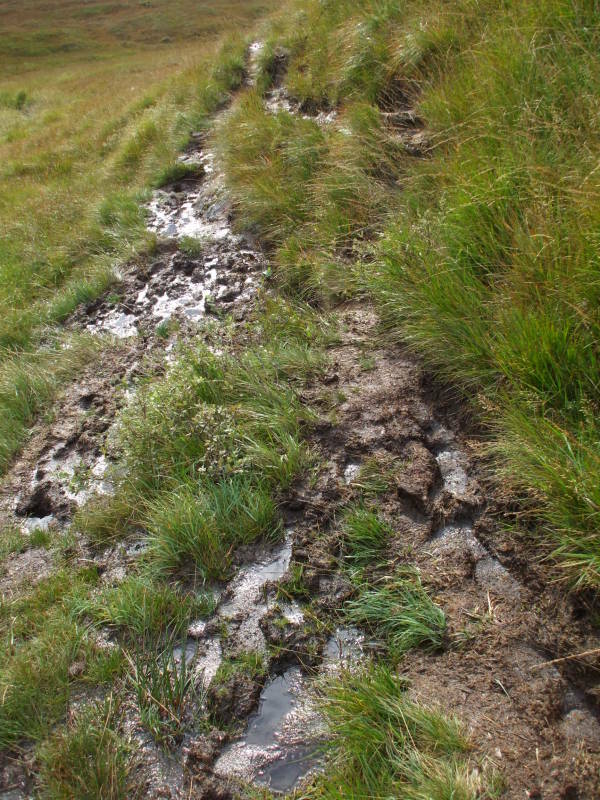 See the muddy churned up path at the first picture here. Yes, that's obvious, better not step right in the muddy parts. Try to step on the grassy hummocks. But then look at that innocent looking shallow water standing in the grass, in the second picture. A little wet, yes. It looks like an innocent puddle on top of some grassy soil. You wouldn't want to jump firmly into that puddle, but it should be reasonable to step softly there, right? Step there and you're going in at least knee deep. More like mid-thigh, in my muddy and somewhat bedraggled experience. Continue on to the northwest. You can see that you're dropping in elevation, and before too long you're getting close. When you get over that next rise, into what was almost very slightly sunlit ground when I was there, you'll be at the point where you can see the end of the main valley. Getting closer — over that rise in the distance and the end will be in sight. 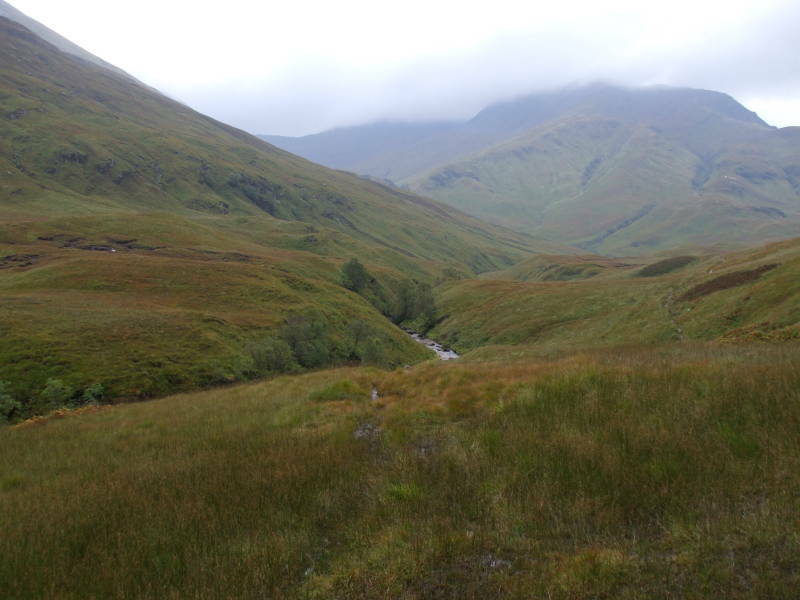 The ruins of the settlement of Steall and the An Steall lodge come into view. 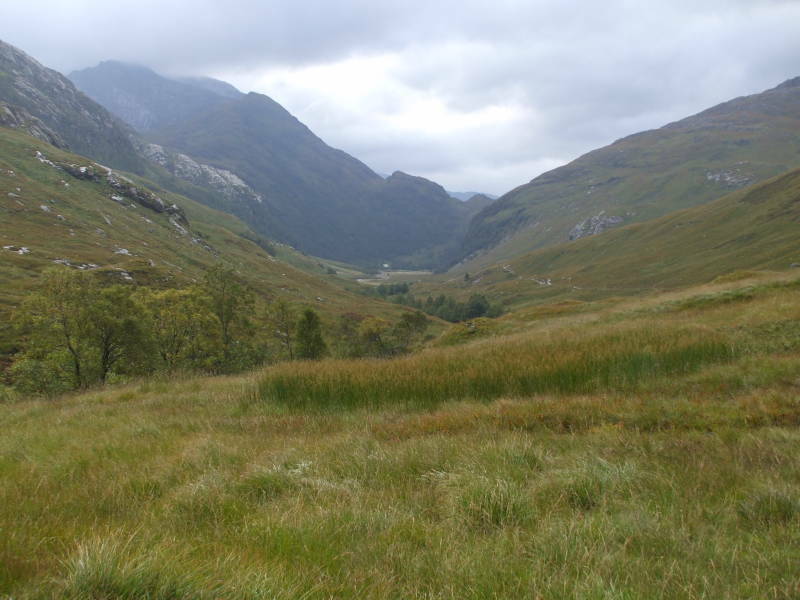 It's still at least a kilometer and a half away, but that light structure far down the valley is the An Steall lodge. You pass through the ruins of the settlement of Steall just before passing the lodge, and you will see An Steall Bàn, the An Steall waterfall.